There really isn't anything else Klay Thompson can say that would further cement his desire to stay with the Warriors beyond the 2018-19 season. He will be an unrestricted free agent in July, and he repeatedly has expressed that he wants to re-sign with the only franchise he has suited up for. But as he ever thought about having his own team? "I don't know what having your own team really means," Klay said in a 1-on-1 sitdown with Stadium's Shams Charania. "I know what it means to be the leader, the captain, the stat-stuffer and all that. 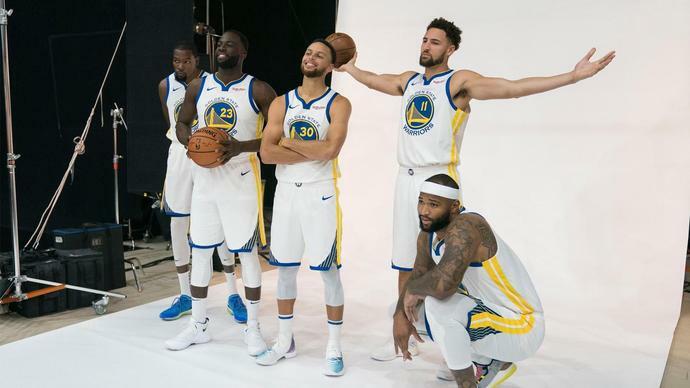 But I don't think this is Steph's team, I don't think this is KD's team, I don't think this is Draymond's team, my team, Andre, Coach Kerr. I think this is our team because without each one of us, we lose a huge part of this team. I think we all understand that. "I've been to the mountaintop. I know what it feels like to win and win with some of your best friends. And that's why it would be hard for me to leave just because I've put so much blood, sweat and tears in this building and with this franchise. I've had my ups and downs, but I couldn't imagine myself being somewhere else. "It's easy for me to say that now, but with time things change. It's hard for me to envision what goes on in nine months. I'm just focused on this off night I got tonight and this off day I got tomorrow. I'm gonna enjoy that to the fullest." Klay -- the 11th pick in the 2011 draft (he wears No. 11) -- will turn 29 years old on Feb. 8. He has been an All-Star for four consecutive years and was named Third-Team All-NBA in 2015 and 2016. Does he consider himself the best two-way, two-guard in the league? "Sure (as he shrugs his shoulder and shakes his head), but that's not something I'm gunning for," he said. "I just want to be the best player I can be. There's so much coverage these days -- there's player rankings, position rankings -- I used to care about that stuff. I heard John Stockton have a quote once actually about basketball being such a team sport and not getting caught up in that stuff. "That really resonated with me. If one of the greatest point guards ever thinks that, then I'm gonna take that same mindset ... I just really want to be the best team we can be because I think that means so much more than being the best player at your position. "If you can be a part of a team that wins championships, you'll be a legend in your respective city and be able to have an impact beyond basketball, and that's what my goal is." Patrick Beverley sounds off on strategy for guarding Kevin Durant in Game 2 originally appeared on nbcsportsbayarea.com Patrick Beverley scored 10 points and dished five assists in the Clippers' comeback win over the Warriors on Monday in Game 2 of the NBA playoffs. He was plus-1, but his value goes so much further than the stats show. Listed at just 6-foot-1 and 185 pounds, Beverley hounded Warriors forward Kevin Durant, who stands just shy of 7-feet.